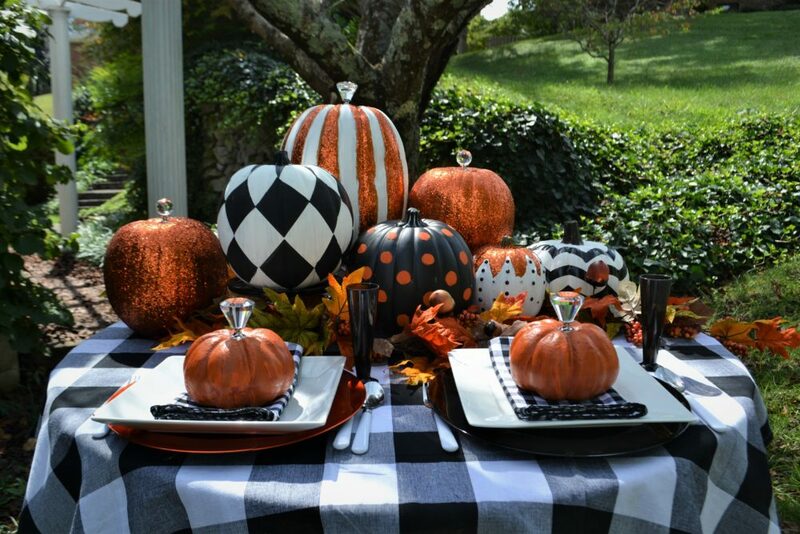 For the best black and white pumpkin tablescape use orange as the accent. 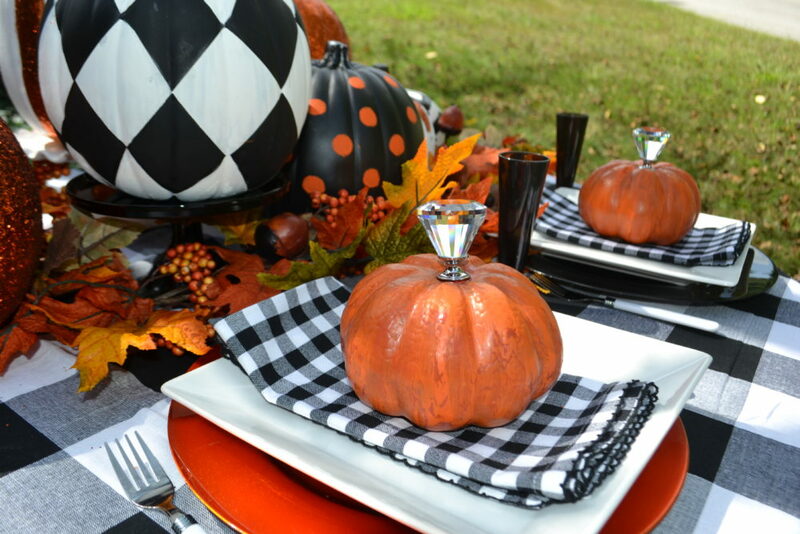 Black and white large plaid table cloth grounds the hand painted faux pumpkin centerpieces. 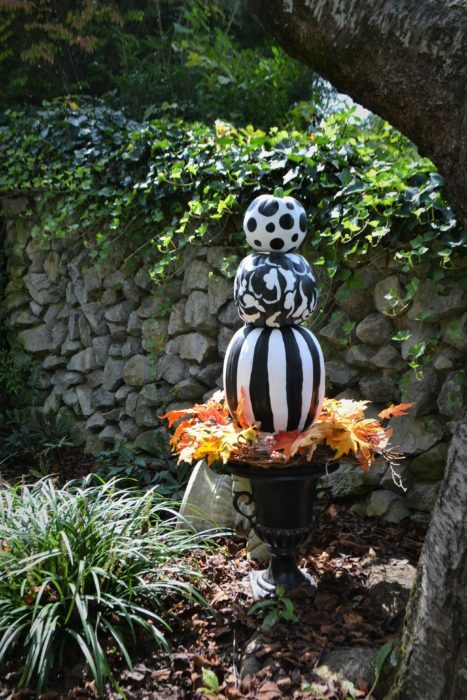 Stack and arrange the painted faux pumpkins on white and black cake stands for various heights. 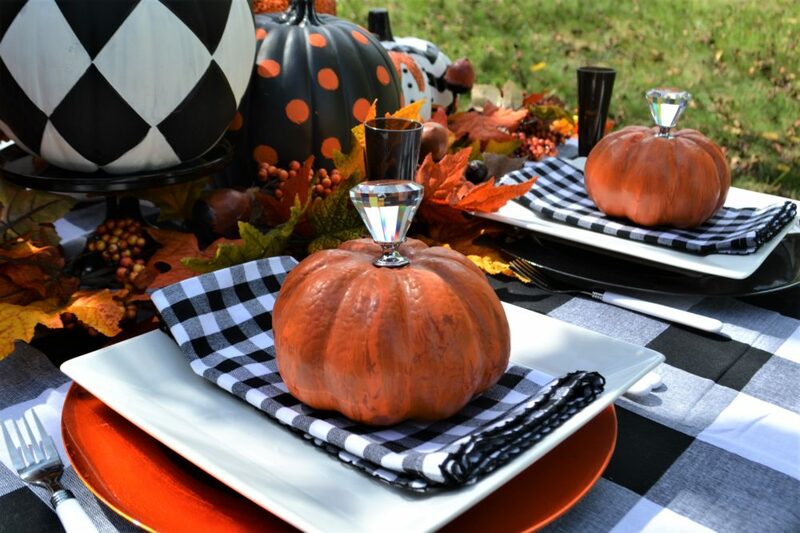 At each place setting white square plates, black and white checked napkins, and medium orangey red pumpkin with diamond cabinet knob stem sits pretty on orange chargers. To make the pumpkins check out these ideas. 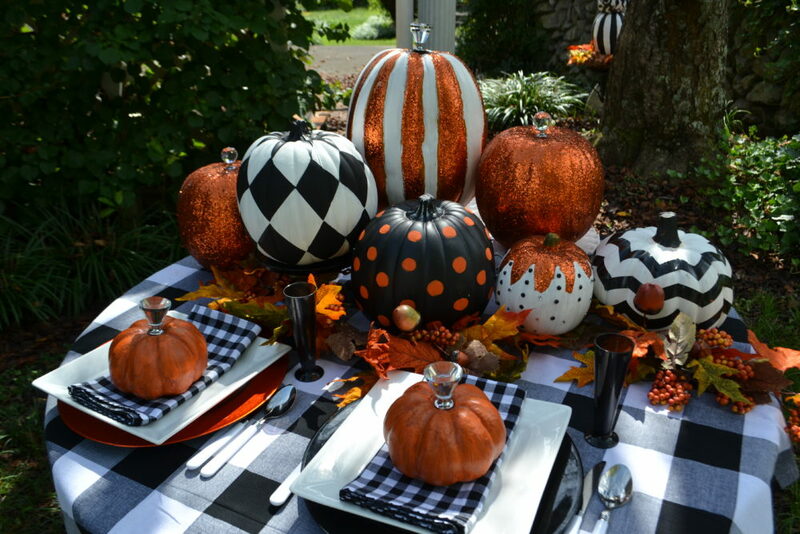 To see how to make the painted pumpkins and topiary click here. The painted pumpkins with *crystal stems (above photo) were painted red and allowed to dry. Next step: a thin layer of liquid Elmers white glue was brushed in one stroke or direction around the pumpkin, while the glue was wet, orange acrylic paint was brushed in same direction all over the pumpkin to create a crackled finish. After completely dry, coat pumpkins with liquid Elmer’s Glue. To create pumpkins in photo, start with different sizes and shapes of faux pumpkins, paint with acrylic paints, white, black and orange. Create dots, glue and glitter all over, black stripes, and diamonds, use electrical tape for zig zags or paint. Note: If you brush the glue back and forth as you normally would paint, you will not get a good crackle. ( Ask me how I know this? ha ha). You can speed up the drying time to see the crackle by using a hair dryer. So fun to watch it crack. *The crystal stems are closet door knobs found at TJ Maxx. Other glass knobs can be found at Home Depot. Click on Topiary photo for instructions on how to make.